New Delhi : After the winking eyebrow game, Priya Prakash Varrier is yet again making headlines. It's been a year that she became an internet sensation and now the actress is all set to make her Bollywood debut with the film Sridevi Bungalow. But the husband of late Sridevi seems disappointed and has sent a legal notice to the film team. Directed by Prasanth Mambully, the film Sridevi Bungalow is already making controversial news as it is said to be a mockery of late actress Sridevi's life. Sridevi died last year, leaving her fans in a state of shock, across the globe. In the film, Priya plays a lonely actress. 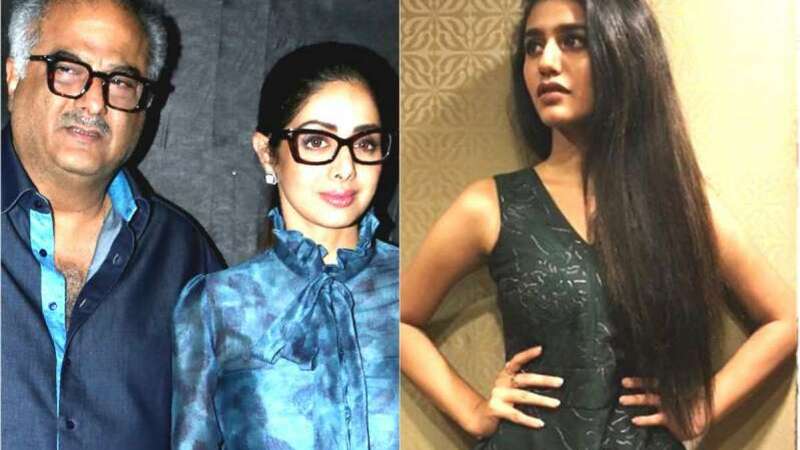 The teaser came under controversy as it showed an actress's death in a bathtub, which is very similar to Sridevi's death that occurred last year. The legendary actress died after accidental drowning in a bathtub and her death sparked debate across the country. Sridevi's husband Boney Kapoor has sent a legal notice to the team. Mambully confirmed this to a portal and said, "We received a legal notice from Mr Boney Kapoor last week. And we will face it. My film is a suspense thriller. I told him (Boney Kapoor) that Sridevi is a common name. My film's character also happens to be an actress. We will face it (the legal case)." Lead actress, Priya, meanwhile, has refused to accept or deny whether the film is based on the actress or not. When the portal contacted Priya's father Prakash, he refused to comment on the legal notice and said it was for the director and producers of the film to address. Sources confirmed that Priya is rumoured to be part of Karan Johar's Takht, and was seen clicking photos with Ranveer Singh and Vicky Kaushal. Earlier it was rumoured that Priya Prakash Varrier will play a key role in Rohit Shetty's film Simmba. However, it was fake news. Now, let's see how the 'Sridevi Bungalow' team overcome the legal warning.